Our Honda dealer in Davis, proudly serving the Davis and Sacramento area since 1978, has a huge selection of new Honda models for sale. Whether you’re searching for a particular model, want to explore your financing options, or are looking for genuine Honda parts, our friendly and knowledgeable staff aims to make your automotive experience as stress-free as possible. Our Honda finance department is here to help you secure the right car for you with a loan that will suit your budget. 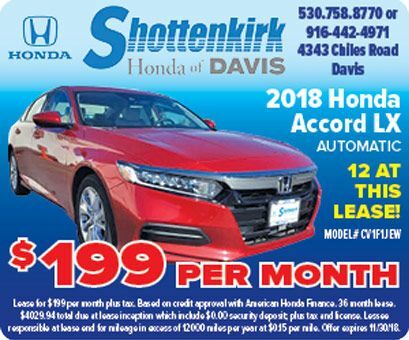 The Shottenkirk Honda of Davis team works with a variety of loan lenders in the area so that we can provide financing opportunities for all of our Vacaville neighbors. With years of experience negotiating competitive auto loan terms and our strong relationship with lenders, our team of experts will sit down with you and make sure you drive off our lot feeling comfortable about your monthly payments. If you’re looking for professional maintenance work completed with genuine car parts then look no further than our Shottenkirk Honda of Davis service department. With extensive service center hours, convenient online booking, and practical service specials, it’s easy to keep your car in tip-top shape. If you’d like to complete service yourself, our Parts Department is more than happy to assist you with all your vehicle needs. We stock a range of quality products that help make completing home repairs a breeze. Visit our Davis Honda dealer serving Vacaville, Davis, Woodland, and Sacramento or contact us today at (530) 250-3295 to schedule a test drive, make a service appointment, or with any questions you might have.